32 | May/June 2018 B A R T S Creations of a veteran artist BY CATHERINE PRITCHARD | PHOTOGRAPHY BY TRISH BROWNLEE But more is going on. Scratchy white lines – not part of the original photo – extend from one of his ears. More scratches cover part of his head and his torso. 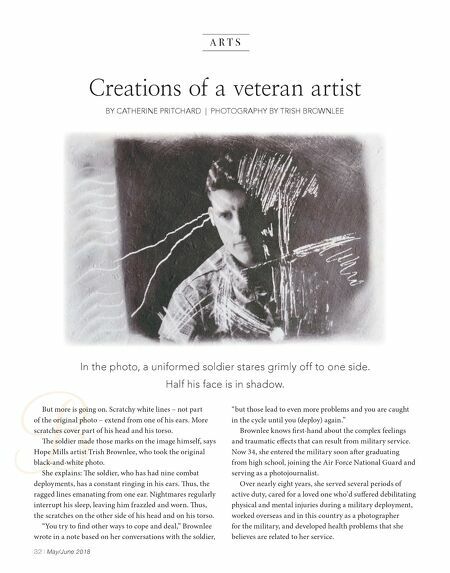 e soldier made those marks on the image himself, says Hope Mills artist Trish Brownlee, who took the original black-and-white photo. She explains: e soldier, who has had nine combat deployments, has a constant ringing in his ears. us, the ragged lines emanating from one ear. Nightmares regularly interrupt his sleep, leaving him frazzled and worn. us, the scratches on the other side of his head and on his torso. "You try to find other ways to cope and deal," Brownlee wrote in a note based on her conversations with the soldier, "but those lead to even more problems and you are caught in the cycle until you (deploy) again." 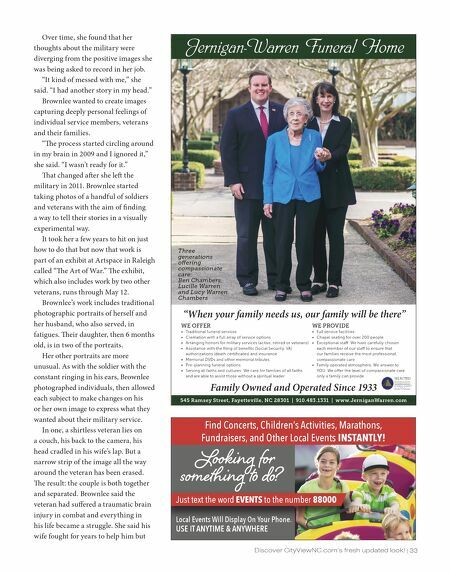 Brownlee knows first-hand about the complex feelings and traumatic effects that can result from military service. Now 34, she entered the military soon aer graduating from high school, joining the Air Force National Guard and serving as a photojournalist. Over nearly eight years, she served several periods of active duty, cared for a loved one who'd suffered debilitating physical and mental injuries during a military deployment, worked overseas and in this country as a photographer for the military, and developed health problems that she believes are related to her service. In the photo, a uniformed soldier stares grimly off to one side. Half his face is in shadow.